Despite the relatively poor outcome of traditional medical procedures for frozen shoulder (physical therapy, cortisone injections, and surgery) the status quo has continued. Too many patients continue to suffer and are told they just have to live with the debilitating, active-life robbing condition. Research also shows the longer someone has shoulder pain and the greater the initial shoulder pain was when the shoulder pain suffer consulted a doctor, the poorer the outcome relative to recovery. Luckily for patients with common shoulder pain and for those suffering with the even more debilitating “frozen shoulder impingement syndrome”, aka “frozen shoulder syndrome, Dr. Allan Oolo Austin, the developer of Trigenics® has developed a rapid cure using a special sequence of Trigenics procedures in a single-session non-surgical operation. Now a world renowned frozen shoulder expert, it took Dr. Oolo Austin more than 2 decades of clinical research to discover the underlying problem and true cause of most frozen shoulder impingement syndromes is related to brain-shoulder muscle miscommunication. In essence, the brain forgets how to use the various shoulder muscles sending improper signals to the muscles which control shoulder movement. An imbalance in the way the shoulder muscles control movement of the shoulder develops. Some muscles become weak with others too tight. This imbalance results in improper movement. As a result of the aberrant signals flowing to and from the brain, the painful loss of movement and weakness remains until the communication is re-established. 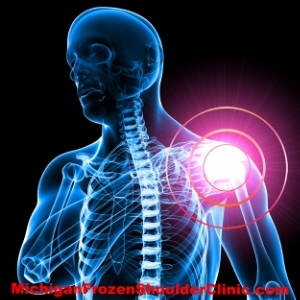 Sometime remission will occur naturally, but usually not due to a downward deterioration spiral and if it does, the recovery is only partial, requiring the shoulder pain sufferer to cope with sub-optimal strength and function.